Here’s how to make leaf mold – or leaf mould, depending on how you like your English. Really, we do not make leaf mold – it makes itself, thanks to the decomposition brought about by bugs and microbes. But we aid the process by a few simple procedures. Leaf mold is incredibly useful in the garden. It is a source of nutrients for plants, makes a brilliant mulch and can be used as a near-perfect seed growing compost. Leaf mold is simply decomposed leaves which have broken down into small soil like particles and fragments. It is easy for plants to further break it down and feed upon it and small insects and microbes are all part of the process. In nature, leaf mold occurs naturally in forests and gardens alike. In autumn when the leaves fall off most trees and lie about in drifts, to the delight of children and dogs, the process begins. Organisms in the soil such as bacteria and fungi colonise the new arrivals. Damp helps the process. Anyone who has ever kicked a pile of leaves will know how quickly damp gets hold of the underlying leaves, even if the top layer of leaves is crisp and fresh. The leaves become darker and limper and filaments from fungal attacks are often noticeable. If the season is a dry one, relatively undamaged leaves can sit about in odd corners until springtime and new growth has to push its way through the natural mulch. 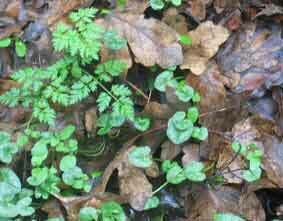 In a damper year, the mulch of dead leaves quickly becomes more and more integrated into the forest floor as organisms use the decaying leaves for their own purposes. Here's how to make leaf mold for use in your garden or containers. The easiest way to make leaf mold is to copy the way a pile of leaves works in nature by providing a quiet corner where the natural breakdown processes can just go on of their own accord. Make a corral from wire mesh and anchor it with a fence post or two or nail it to a wooden pallet from the side of a compost bin. You could also use canes or hazel sticks pushed into the earth. The wire mesh needs to be small enough to contain the leaves easily. It can be any shape but round or square is most efficient. It can just sit on the ground, where organisms from the earth have free access to the pile. Just pile the leaves into the container and make sure it is secure. If you do not want the trouble of a wire mesh enclosure, just recycle or buy a large stout plastic bag. Put a few holes in the bottom so that excess water can drain out effectively. This will work just as well. Leave the top open to the air and rain. Stand the bags somewhere out of the way for a year or two. Rake up leaves from your garden – or from a nearby public woodland area if you do not have any trees. Check you are not violating any local statutes, of course. It's best to avoid trees from roadsides and anywhere else that might harbour pollutants. Also avoid deep drifts in out of the way corners and under hedges - you risk disturbing wildlife. Any deciduous leaves are useful but smaller and thinner leaves will tend to break down faster. Oak, ash and field maple will all make good leaf mold. 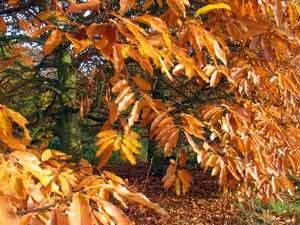 Chestnuts and sycamore leaves tend to decompose rather more slowly but are still useful sources for leaf mold. Avoid most conifers and evergreens. Ornamental trees can be used but be aware of trees which are strongly acid - for example pine trees. If your homemade leaf mold is dominated by acid-loving species it may affect what you can grow successfully when using the leaf mold as mulch. You can buy special scoop shaped hand mitts for collecting leaves but a couple of light-weight boards held in the hand are probably just as good. A spring-tine rake is useful as it is quicker than a standard rake for raking leaves. 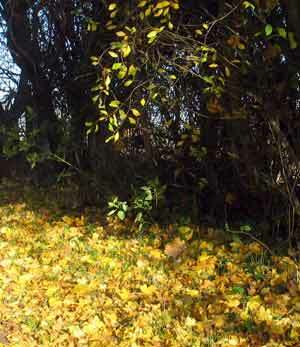 Rake with the wind, rather than against it – but a relatively windless day is easiest for collecting leaves. Pile the leaves into your chosen leaf mold store. If they are dry, add some water straight away. Fill the bags or cage to about 2/3rds full so that the top leaves do not blow away. Leave them for around a year and you should be able to harvest a very valuable crop of leaf mold which will keep you from having to rush down to the garden centre to buy seed compost and soil improver! It is best not to cover the leaves with anything. I covered one lot with plastic and not only did they not rot down much but there was also a pretty little rodent nest made from dry moss – with a do not disturb sign (well, I think it was just a wood mouse). Most inconvenient! If you are worried about them keeling over or blowing away then cover them loosely and weight the cover down with a stone or similar. You might need to add water from time to time if the weather is very dry. Your leaf mold should be ready within two years - less if you use small leaves and make sure the pile stays damp. You can incorporate a bit of cut grass - lawn mowings. Mowing the lawn is also a good way to start the break up process. Just mow over the leaves and tip the contents into the leaf mold bin. If you would rather fertilise your lawn, leave the grass box off and let the mown grass and leaves remain on the surface. You can also collect twigs and small pieces of natural wood as they will also break down slowly along with the leaves. Don't add any seed bearing plant materials as you will want to make leaf mold that is reasonably free of seed. This is particularly important if you are using leaf mold for starting seeds off. Leaf mold does do very well for starting off seedlings. I've not noticed any down side so far. It is free and means you do not have to rely on expensive and unsustainable peat-based compost. Peat is a non-renewable resource. Its extraction is causing a lot of damage to peat bogs in Britain and Ireland and elsewhere. One of the resons that this is an important issue is that these peat bogs are habitats for many rare species of insects, birds and plants. 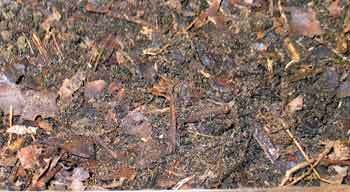 You can also use leaf mold just as you would garden compost or soil improver. It will aid the structure of the soil, creating that valuable friable tilth so beloved of experienced gardeners. It also adds nutrients. It is rich in carbon. Spread it liberally over beds in autumn and use it as a mulch to suppress weeds. Another advantage of using homemade leaf mold is that it removes the need to light fires - time saving and better for the environment, too. Probably better for neighbourly good relations as well! You can also use leaf mold for covering garden paths and walkways. The one year old stuff is actually better for this as it is less fragmentary. Use leaf mold to cover any bare soil. This will feed the soil via all those little organisms that make natural soil tick. It will also help prevent loss of nitrogen and other nutrients. Picture: leaf mold - after one year of storage in a wire enclosure. There are still some bits but very usable. Please do not copy without permission except for personal use. Compost barrel or compost turner?